How does the Australian Synchrotron work? How do ions make tracks? How is synchrotron light created? The Infrared Microspectroscopy (IRM) beamline combines the high brilliance and high collimation of the synchrotron beam with a Bruker V80v Fourier transform infrared (FTIR) spectrometer and a Hyperion 2000 IR microscope to reach high signal-to-noise ratios at diffraction limited spatial resolutions; between 3-8 μm. This makes the beamline ideally suited to the analysis of microscopic samples e.g. small particles and thin layers within complex matrices, or thin coatings on surfaces. In addition, a Hyperion 3000 Focal Plane Array (FPA) FTIR microscope is also installed offline at the beamline. This allows users to collect large area overview IR images from their samples prior to high resolution mapping using the beamline instrument. In each of the above modes a motorised stage allows the point-by-point collection (raster mapping) of individual spectra from a sample, to create spatially resolved “spectral maps” (see Techniques Available for more information). Figure 1. The IR Microscopy Cabin. Figure 2. 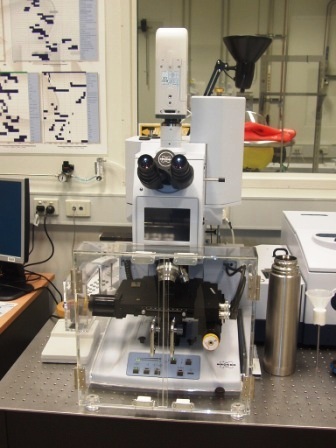 The Bruker V80v FT-IR spectrometer and Hyperion 2000 IR Microscope. Figure 3. The Bruker Hyperion 3000 Focal Plane Array microscope. Each microscope is a combined IR/white-light microscope, to allow visible images of each sample to be collected and areas of interest highlighted for IR analysis: Köhler apertures and fluorescence illumination (excitation @480nm; emission@520nm) are available to assist with sample contrast.